But I had always thought that the cover design for the Services editions was unique to this series. It shows a sort of stylised view out over the sea, with what is presumably meant to be the White Cliffs of Dover in the foreground, perhaps inspired by the popular song at the time from Vera Lynn. 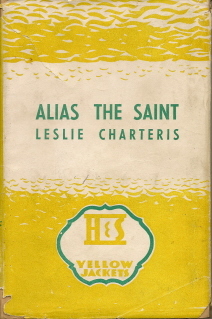 The sea at the bottom is blue, the sunlit sky at the top is yellow, for consistency with the Yellow Jacket name, and the two merge together with a sort of wave motif. In between the cliff edges is a stylish sort of shield as a logo for the series. 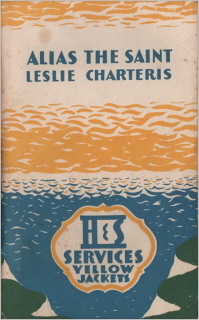 I’ve recently come across though a Hodder & Stoughton edition with a dustwrapper clearly based on the same cover design, that is not a Services edition, although it is a book that did appear in the Services series. The design is now all in yellow and the cliffs have been removed, so that it is no longer clear what it’s meant to represent. The wave motif has been retained but is now meaningless, and the same logo has been retained, but with the word ‘Services’ removed. The book is a hardback printed in South Africa on poor quality paper, with no date, but presumably shortly after the war. It may have been intended for the local market or for importing back to the UK. Was it just laziness on the part of the publisher, re-using a cover design that happened to be at hand, or something more deliberate and widespread? Am I wrong in thinking that the design was meant to be unique to the Services series?